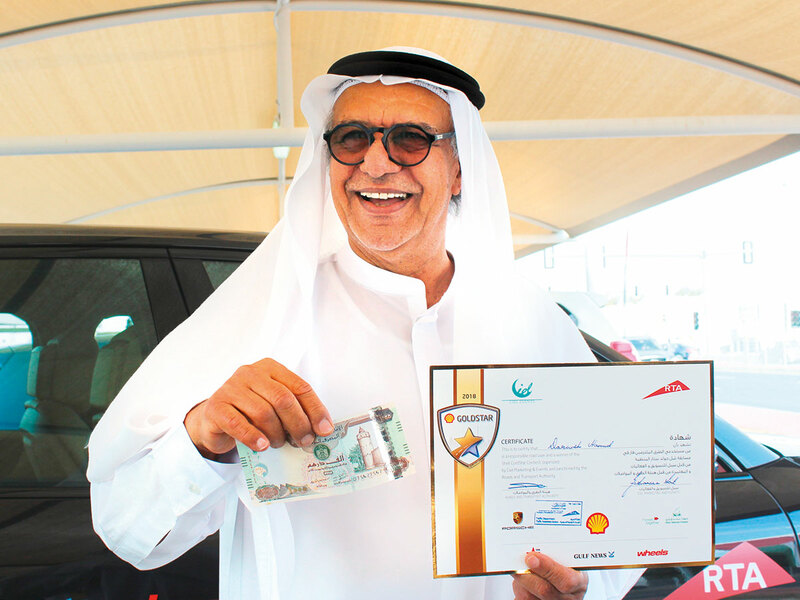 Dubai: Darwish Hamid, 66, is a careful driver, but he never thought he would win an award or a cash prize for being safe on road. 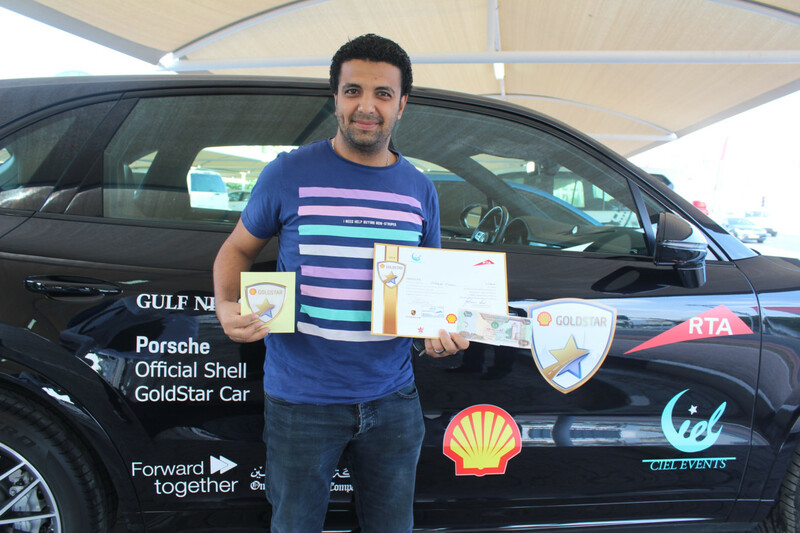 Hamid, a retired UAE Army general, is among 10 Responsible Road Users Award who drove away with Dh1,000 each as part of the Shell GoldStar Contest that recognises drivers for following road safety practices, such as using seatbelts, staying off the phone, lane discipline, using child safety seats, using indicators and observing speed limits. Other road users are awarded for use of designated pedestrian crossings and road traffic safety practices to reduce risks associated with cycling. The three-day road safety initiative is being held from November 26 to 28, across Dubai and Sharjah in collaboration with Gulf News, the Roads and Transport Authority (RTA) in Dubai, Sharjah Police and Ciel Marketing and Events. “I was surprised when I was asked to pull over and an official came and asked for me from my driving licence and vehicle registration card. I thought I was getting a fine, but at the same time I was wondering what’s my fault. But thankfully it was not a fine but a cash reward,” said Hamid, who was so happy with the recognition that he spent all the prize money in a coffee shop with his friends. 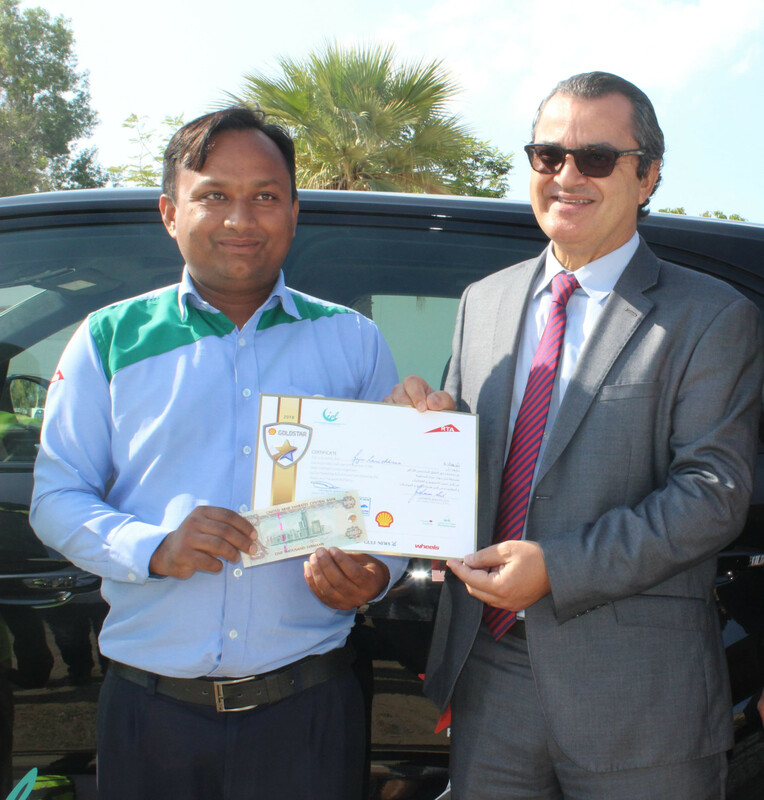 For sales merchandiser Khalid Kareem, it was a usual day at work, until he realised something unusual as he pulled into the parking lot of Spinney’s in Umm Suqeim. “I was on duty and I was going to Spinney’s as part of my work and I was driving the way I normally do. When I pulled into the parking lot I realised that a vehicle was tailing me and there were others in the parking lot who were observing me. I was wondering what happening and it turned out to be a good surprise,” said Khalid Karem, an Egyptian expatriate. The 30 year old is expecting his first child soon and is planning to buy gifts for his wife and the coming child. 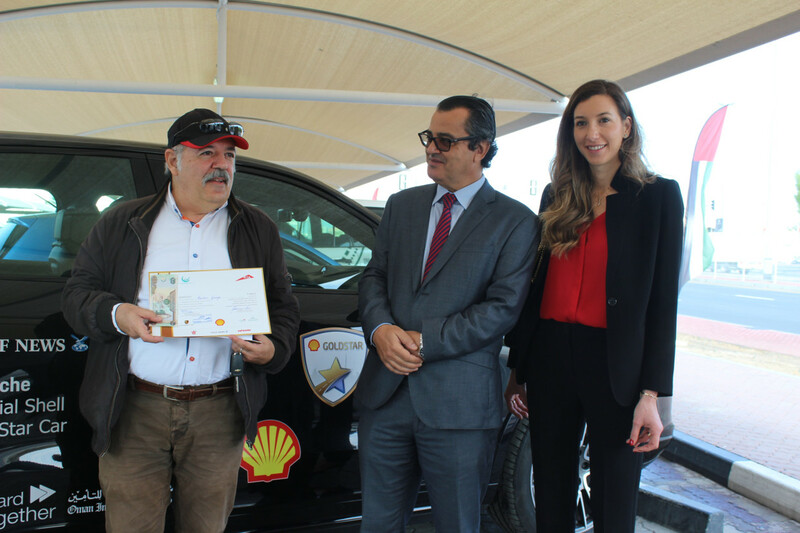 “Road incidents and fatalities are tragically common occurrences and we hope that the Shell GoldStar Contest raises awareness around road safety in the UAE to improve and encourage safe driving practices”, said Mounir Bouaziz, Shell Country Chairman for Dubai and the Northern Emirates. Effective driver education and public awareness campaigns are key to reducing road accidents. In support of the UAE Vision 2021 National Agenda that aims to reduce the number of road deaths to three per 100,000 residents by 2021, the campaign encourages road users to incorporate good safety habits into their daily routines. A total of Dh30,000 will be awarded during the three-day campaign, with 10 road users selected for each day of the campaign. The campaign is also supported by Friday magazine, Wheels magazine, Virgin Radio, Oman Insurance and Porsche Centre Dubai.